You could be forgiven for thinking that this was an image from the Lord of the Rings, the eye of Sauron casting its gaze over Mordor. 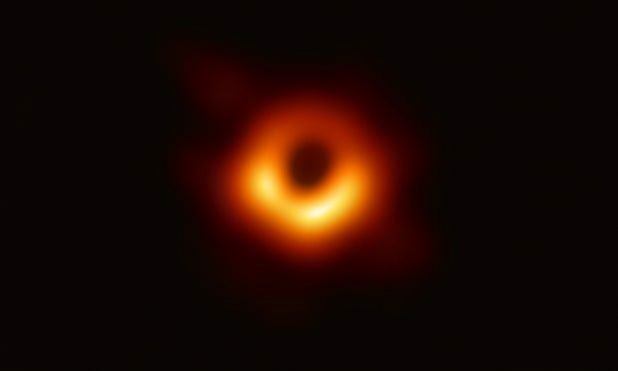 But Hobbits need not worry as this is in fact the first ever picture taken of a black hole. A black hole is basically an area of space from which nothing, not even light, can escape. The image is actually a halo of dust and gas which outlines a huge black hole located 500 million trillion KM away. The image could lead to a greater understanding of one of the universes most complex objects. This black hole has been described as an absolute monster of a black hole. It’s hard to put its size into context, it measures 40 billion KM across which is 3 million times the size of Earth. Professor Heino Falcke of Radboud University in the Netherlands, who proposed the experiment, said “what we see is larger than the size of our entire Solar System”. No single telescope is powerful enough to capture such an image. It was taken by a network of eight linked telescopes known as the Event Horizon Telescope. Professor Sheperd Doeleman of Harvard University described it as “an extraordinary scientific feat” and went on to say “we have achieved something presumed to be impossible just a generation ago”. A lot of the credit for the historic picture has to go to Katie Bouman. She led the development of a computer programme that made it possible to capture the image. With the help of others, she managed to come up with a series of algorithms that converted the telescope data into the now famous image. Dr Bouman was quick to point out it was a group effort saying “We’re a melting pot of astronomers, physicists, mathematicians and engineers, and that’s what it took to achieve something once thought impossible”.